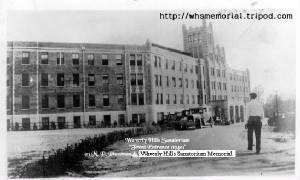 What is Waverly Hills Sanatorium? Patients of W.H.S. / W.G.C. Doctors & Staff of W.H.S. / W.G.C. Welcome to the Official Waverly Hills/ Woodhaven memorial & historical resource site. Our objective is to provide a resource and a memorial for all the building and the people whose lives made an impact on Louisville's history. Our objective is the facts as we are a resource. All information contained in this website will be confirmed information either by photograph, news article, and/ or historical archive of some kind. This site will currently be the memorial for the tuberculosis & geriatric hospitals. Plans are underway for an on site memorial for all the names listed and to be listed. All information / names gathered from research and visitors will be added to the memorial. Please note: We are not connected to The Waverly Hills Historical Society, Inc. Views, comments, posts, publications, etc... do not reflect the views of The Waverly Hills Historical Society, Inc.
Meet the Patients of Waverly! WHS Memorial Website would like give a warm and heartfelt thanks to all the wonderful people who've shared photos and the stories of their family members who were patients and staff members of Waverly Hills. This website would be nothing without you. Thank you! and can not be used in any means without written persmission from the owner of the media.